Following a bank error, a man became a multi-billionaire for a few hours just after opening a bank account with N103,485. The man, Wuttichai Meemak, from Phetchaburi in Thailand, opened an account with a local bank, Krungthai Bank and deposited 9,000 THB or Thai baht (about N103,485) into his new account. 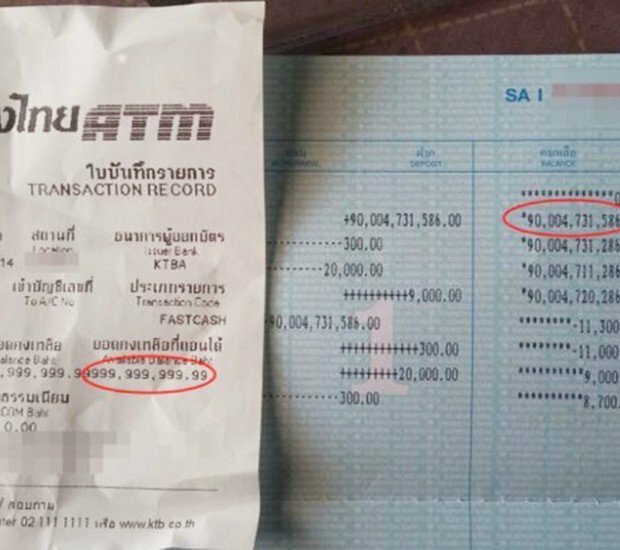 However, he received the shock of his life minutes when he checked his account balance at an ATM point outside the bank and discovered 999 999 999 THB (N11.5 billion). He first thought there was a fault with that particular machine, so he tried another one nearby. To check if he could really withdraw the money, he tried to withdrawn an amount higher than what he had deposited. Meemak said, “I tried to check whether it was an error. He said he was tempted to go on a shopping spree but was restrained by the realisation that he could go to prison for it. “Images of a car and a house immediately came to my mind, only to be replaced with a jail, a jail, and a jail. So I informed the bank. The bank staff was stunned but it’s not my money,” he added. The bank staff then rectified the issue.